A common assignment in college courses is to assign an original research paper, due at the end of the semester. And despite the findings of many pedagogical studies, which suggest that assignments should be scaffolded (broken into chunks that build on each other), the final paper is often left just as that—a single assignment which we expect our students to call into being from nothing. At Truman State University, our History Department majors are expected to write a capstone paper at the end of their time at the school, and fortunately, the capstone is scaffolded by a research course. However, that research course is also taken near the end of the students’ careers at Truman, and they might enter the research course with very little experience or understanding of research—despite being fourth-year students. This spring, to help support students’ research skills, I ran an experiment in my two upper division History courses. 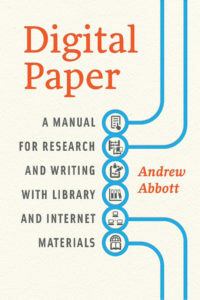 I decided to require Andrew Abbott’s Digital Paper: A Manual for Research and Writing with Library and Internet Materials, and to devote class time to discussing most of its chapters. Abbott’s book is ostensibly intended for audiences of varying levels, from undergraduates to professional researchers. Abbott systematizes the act of research and also demystifies it , but I found that students were a little confused by the systematization of research, because it is by nature a nonlinear process. So as Abbott points out, the “system” must account for that nonlinearity. Using Abbott’s system as a guide, I scaffolded the final paper with a handful of assignments: an initial presentation of historical questions; two annotated bibliographies; and a final presentation on the refined questions and preliminary results. 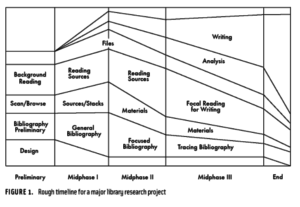 Abbott’s timeline of research, demonstrating the need to do multiple sub-projects at one time. I couched the Abbott in terms of an experiment because I was not sure how well students would respond to reading about and discussing the craft of research: would they take Abbott’s advice to heart? Would their research and/or writing be improved by the time we spent on this? Questionnaires filled out by all students at the end of the semester showed that the overwhelming majority of students in both classes thought that the time we spent on Digital Paper was helpful. This blog post will detail the ways in which I found Abbott clearly helped the students, as well as students’ perceptions of the usefulness of the book. There are two elements that I believe improved students’ work the most: first, students became far more aware of the need to gauge the quality of their sources; and second, students benefited from the discussion of empirical and theoretical puzzles, which improved their abilities to craft argumentative paper theses, and also helped them to narrow their projects. One of Abbott’s most useful formalizations is his discussion of empirical and theoretical puzzles, which become the foundation for both research and writing. It’s difficult to teach students how to develop projects whose scope is narrow enough for a college paper, and it’s difficult to teach them how to write argumentative theses so that their papers take a position and argue for them. Abbott’s puzzles help with both these problems. Abbott basically argues that most research comes down to a researcher finding a phenomenon puzzling and asking why and how that came about. In the case of history, that translates into someone finding a historical event, process, group, phenomenon, etc., and asking why. So for example, as I worked on my dissertation, I found that the Romans tried repeatedly to maintain control over Armenia, and yet, they failed over and over. Why? That’s an example of Abbott’s empirical puzzle: something happened in the world, and it’s up to me to figure out why. The theoretical puzzles come next as possible answers to the empirical puzzles. Given the empirical happening in the world, how might we arrive at an answer? So for example, with the Romans in Armenia, it might be beneficial to pose the question of whether the Romans were actually working very hard to keep hegemony—what if they did not actually want it? That could be a theoretical puzzle that I would then try to answer. A next step when arriving at a theoretical puzzle to help you think through your empirical puzzle would be to ask what evidence you might need, and what discrete information you will need to answer the theoretical puzzle. Abbott calls these more granular questions “research questions”; here, that might include researching the nature of Roman-Armenian political relations and identifying the data that tells us about those relations; asking what the Romans wanted in the Armenian Highland; and also inquiring into what kind of competing Armenian political practices we might be able to see. Empirical puzzle: why did this thing happen? Together, these three elements (most especially the empirical and theoretical puzzles) can then be used to craft an argumentative thesis that takes a strong position: “[Empirical puzzle] because [theoretical puzzle].” Teaching students the structure of questioning as a matter of Abbott’s empirical and theoretical puzzles meant that they were almost naturally led into taking stronger positions in their papers and then arguing for them. In addition, requiring students to articulate their empirical and theoretical puzzles helped them to narrow their projects and craft them in terms that were manageable over the course of the semester. One student whose writing skills were particularly strong remarked on his final questionnaire that thinking about the puzzles helped him narrow his topic “into something more real that I could test.” The puzzles asked students to think about their questions that drove the paper, and they were forced to think about the project as a complete whole, not a nebulous cloud of sources to examine. Students found Digital Paper illuminating in thinking about source quality, and they found the book helpful in focusing their projects and crafting arguments. Students also commented on a few other aspects of the book as helpful. For example, students seemed to appreciate the revelation that research and writing are nonlinear: a handful mentioned that they had thought they were somehow doing research “wrong” before, when they found it nonlinear; and some mentioned that they felt freer to set an unproductive avenue of research aside and start something different when they got stuck. Many students also found helpful the discussion of types of reading. In Chapter 6, “Midphase Scanning, Browsing, and Brute Force,” Abbott argues that the degree of focus one uses when reading is variable. One might scan material quickly in search of key terms; or one might pay more attention when the source is likely to be more valuable and so browse the material; or finally, when one knows that the source will be useful to the project, one might brute-force all the way through the material carefully. Students found this system helpful when thinking through the creation of bibliographies, because it meant it was ok not to brute-force absolutely all sources. Not all students thought that the work was universally useful. Of the 29 final questionnaires, two categorically denied the usefulness of Digital Paper to their experiences of my class or their college careers. However, both of those respondents also admitted that they did not regularly read the book nor did they take the time to try his methods. Four questionnaires maintained that the book’s usefulness depended on context; two said that the level of the book was appropriate for first-years, but was also perhaps a little below their current capabilities as third- and fourth-year students. I would teach with Digital Paper again, and I would also scaffold the final papers again. Next time, I would add a further step of turning in either an introduction or at least theses, so that I could see the frames students were using to set up their final papers. Since I focus on skill development in my classes and believe that content provides a medium for fostering students’ skills, I will continue to work explicitly on research in upper-division courses. I may also use the discussion of internet sources in lower-division courses, just to get students started thinking early about quality of sources. I did find Abbott’s use of empirical and theoretical puzzles helpful enough that I may have a difficult time finding a better discussion to guide the projects, but I would also be open to exploring other books about research. This entry was posted in History, Teaching on June 5, 2018 by Elizabeth.